Can I get heated seats? Do I have to get a sunroof? 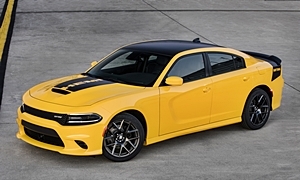 Find out what you need to know about Dodge features right here. Performance braking system (optional)Only listed if not standard on all trims. No value because no way to compare across models. Upgraded stability controlAdditional features for stability control, such as performance calibration. Additional features for stability control, such as performance calibration. Rear air ventsVents at aft end of center console, in B-pillars, and/or in ceiling. Vents at aft end of center console, in B-pillars, and/or in ceiling. Satellite radio - one year subscriptionXM or Sirius with one-year subscription. XM or Sirius with one-year subscription. Text dictationDictate text for messages and/or emails. Annual fee. Dictate text for messages and/or emails. Annual fee. Hood scoopScoop on the hood, often not functional and purely decorative. Scoop on the hood, often not functional and purely decorative. Hood stripesOnly listed if not standard on all trims. No value because no way to compare across models. Laminated front side windowsReduces interior noise, prevents side windows from shattering. Reduces interior noise, prevents side windows from shattering. Painted brake calipers, alternate colorNo value since replaces painted brake calipers. No value since replaces painted brake calipers. Boost gaugeReports the amount of boost being provided by the supercharger or turbocharger. Reports the amount of boost being provided by the supercharger or turbocharger. Performance meterMeasures and displays lateral acceleration. Some also measure and display 0-60, quarter mile, etc. Measures and displays lateral acceleration. Some also measure and display 0-60, quarter mile, etc. Cold air intake (optional)Engine intake placed to take in relatively cool outside air, as opposed to underhood air. Might add a few horsepower. Engine intake placed to take in relatively cool outside air, as opposed to underhood air. Might add a few horsepower. Dual-mode exhaustValves open in the exhaust at high rpm and/or during brisk acceleration, for power boost and/or richer sound. Valves open in the exhaust at high rpm and/or during brisk acceleration, for power boost and/or richer sound. Engine-block heaterPlugs into electrical outlet to warm up the engine. Facilitates starting in extreme cold. Plugs into electrical outlet to warm up the engine. Facilitates starting in extreme cold. Launch controlElectronically controls engine and transmission for perfect launch. Electronically controls engine and transmission for perfect launch. Raised top speed limiterPermits a higher top speed before fuel cutoff kicks in. Permits a higher top speed before fuel cutoff kicks in. Color seat beltsUsually red or yellow. Interior trim, special colorOnly listed if not standard on all trims. No value because no way to compare across models. Power 4-way lumbar adjuster, driver seatLower back support power-adjustable vertically as well as in and out. Lower back support power-adjustable vertically as well as in and out. Power 4-way lumbar adjuster, passenger seatLower back support power-adjustable vertically as well as in and out. Power tilt adjuster, passenger seatPower tilting seat cushion; can take the form of a second height adjustment. Synthetic suede inserts in leather seating surfacesSeating surfaces are part leather, part synthetic suede. Seating surfaces are part leather, part synthetic suede. Upgraded cloth upholsteryOnly listed if not standard on all trims. No value because no way to compare across models. Alloy wheels, optional designSame value as regular alloy wheels because no way to compare across models. Same value as regular alloy wheels because no way to compare across models. Summer tires (optional)Only listed if not standard on all trims. No value because no way to compare across models. Ultra-sport suspension (upgrade)Only listed if not standard on all trims. No value because no way to compare across models. None of our members have yet commented on the available features of the 2019 Dodge .